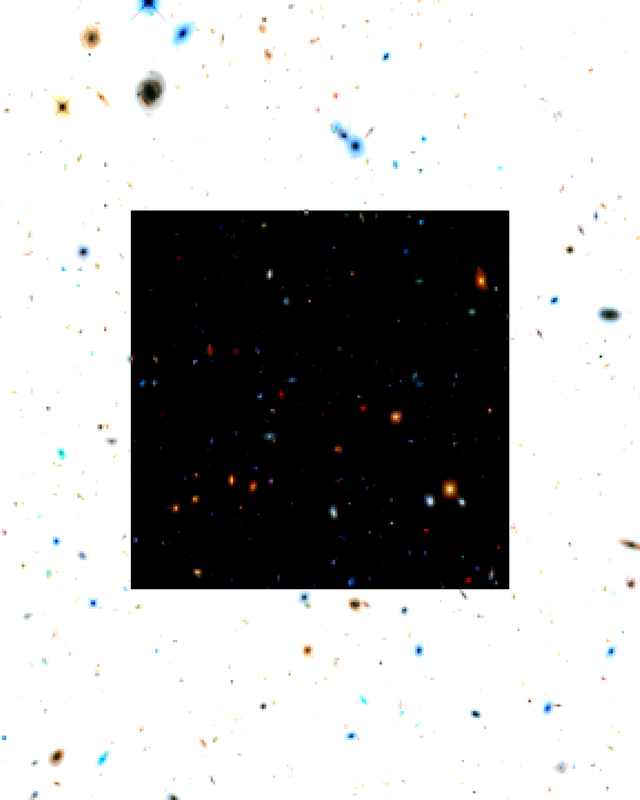 Tom R. Chambers utilzes images of the Universe (courtesy of HubbleSite [http://hubblesite.org]) in combination with Kazimir Malevich's "Black Square" to confirm his (Malevich) interest in Astronomy and connection of his Suprematist work with the Universe. 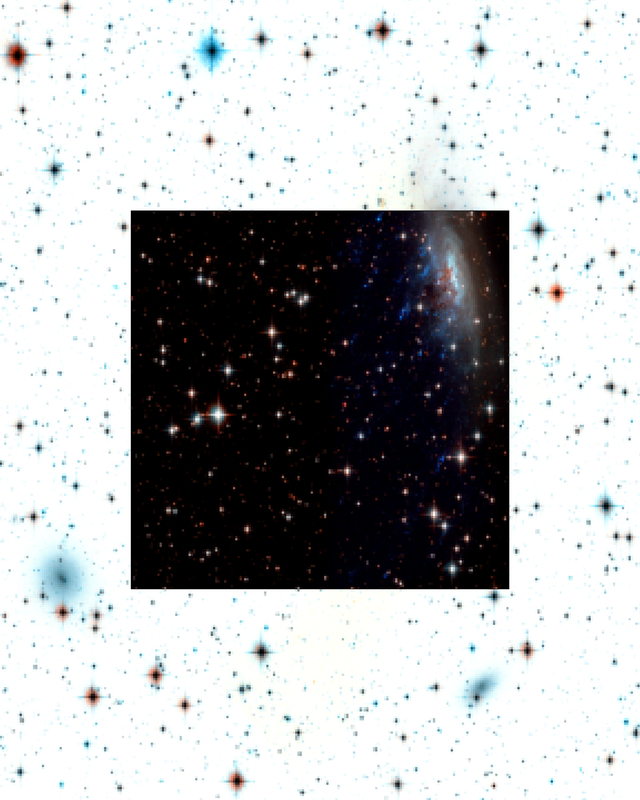 The "Space" images have been pixellated to show abstractions - configurations of pixels - running throughout the "Black Square" and beyond ("white abyss"). Malevich's "Black Square" becomes monolithic/monumental. Malevich called himself, "President of s(S)pace". "Each shape has a real type of time and the coloration of colors is the power of the time's oscillation, time's movement creates shape while simultaneously coloring it and consequently the speed of time can be defined by color." It was his work on "Victory Over the Sun" that gave rise to his first personal "ism", Alogical Fevralism. Speaking at a debate in February 1914, Malevich announced that he had "rejected reason". He was now placing his bets on irrational "sensation". Freed from objective representations, this would lie at the heart of the new art, Suprematism and, through it, a new world view, and could rest only on phenomena that were purposely not subject to the distorting directives of human reason. He perceived these phenomena in physical manifestations such as electricity, Röntgen rays and gravitation, which were invisible in s(S)pace and time. In spring 1915 the solar symbolism of "Victory Over the Sun" took on new meaning for Malevich. In addition to its "desconstructivist" (his own term) objectives, the Futurist masterpiece was discovered to have utopian-constructive potential, which he linked to the energetic essence of universal processes and their invisible incorporeal might. He would consider embodying Nature's true being to be the goal of both his own art and art as a whole. Malevich included the expression "partial eclipse" in his works during his Fevralism period, such as "Composition with Mona Lisa", 1914. His "Black Square" of 1915 marked the "total eclipse" that had long been maturing in his art. The black rectangular plane definitively crowded out the natural celestial body that had ensured the sensory perception of earthly reality. It shifted its creator to another - purely speculative - dimension. "A system is being constructed in time and s(S)pace; independent of any aesthetic beauties, experiences, moods, rather [it] is a philosophical color system for realizing the new achievements of my ideas as cognition," Malevich wrote in the preface to a 1919 group exhibition in Moscow. Subsequently, in his theoretical works he expanded several times on the unitary nature of the Universe's spaces and "the infinite space of the human skull". In Malevich's everyday life, his proclamation of the inevitable break from Earth and speculative mastery of space turned into a passionate immersion in Astronomy. During his Vitebsk years (1919-22), he was never parted from his pocket telescope, constantly observing and studying the starry sky, the map of which he knew thoroughly. This engendered one of his most astounding texts, "Suprematism: 34 Drawings", published on December 15, 1920 with its prophetic lines in the introduction about humanity's Cosmic future. It was here that he gave the ordinary word "sputnik" - Russian for companion or fellow traveller - the meaning that made it famous. As we know, "sputnik" has existed in all the world's languages without translation ever since the call signs of an artificial, man-made celestial body went out on October 4, 1957. "The Suprematist machine, if it can be put that way, will be single-purposed and have no attachments. A bar alloyed with all the elements, like the Earthly sphere, will bear the life of perfections, so that each constructed Suprematist body will be included in Nature's natural organisation and will form a new sputnik; it is merely a matter of finding the relationship between the two bodies racing in s(S)pace. A new sputnik can be built between Earth and Moon, a Suprematist sputnik equipped with all the elements that moves in an orbit, forming its own new path." BSS-1: CLASH Galaxy Cluster MACS J2129-0741. This is a wider view of galaxy cluster MACS J2129-0741, located in the constellation Aquarius. 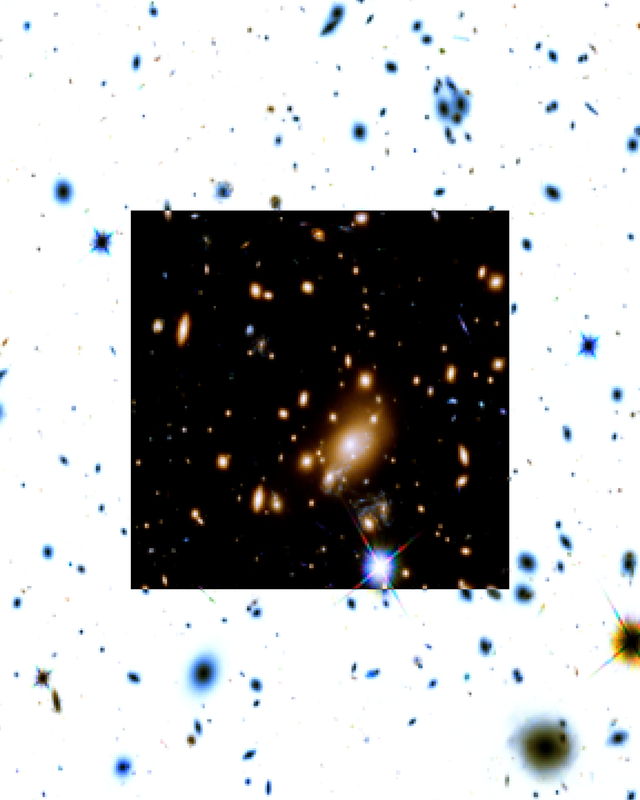 The massive galaxy cluster magnifies, brightens, and distorts the images of remote background galaxies, including the far-distant, dead disk galaxy MACS2129-1. Credits: NASA, ESA, M. Postman (STScI), and the CLASH team. 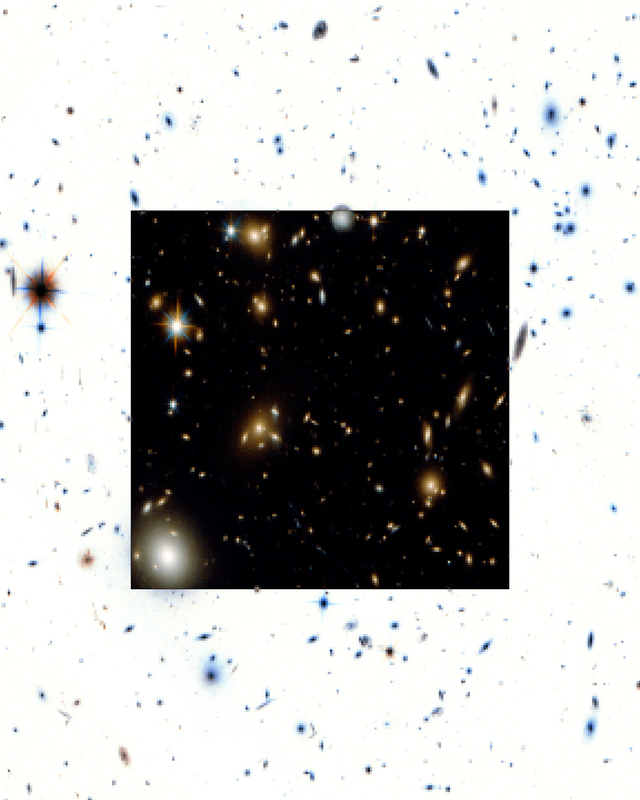 BSS-2: Wide Field Image of Galaxy Cluster SDSS J1110+6459. 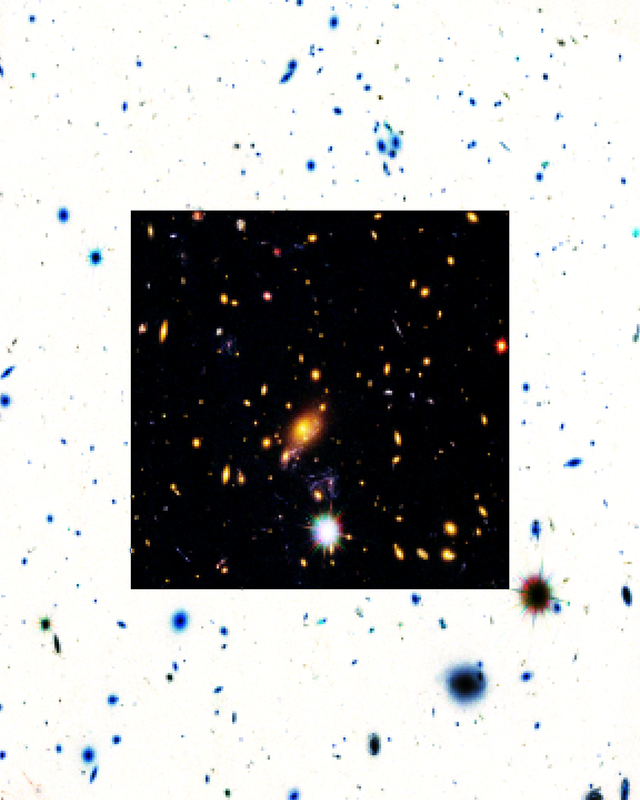 The galaxy cluster SDSS J1110+6459 was discovered as part of the Sloan Giant Arcs Survey. It is located about 6 billion light-years from Earth (redshift of z=0.659) and contains hundreds of galaxies. A distinctive blue arc is actually composed of three separate images of a more distant background galaxy called SGAS J111020.0+645950.8. 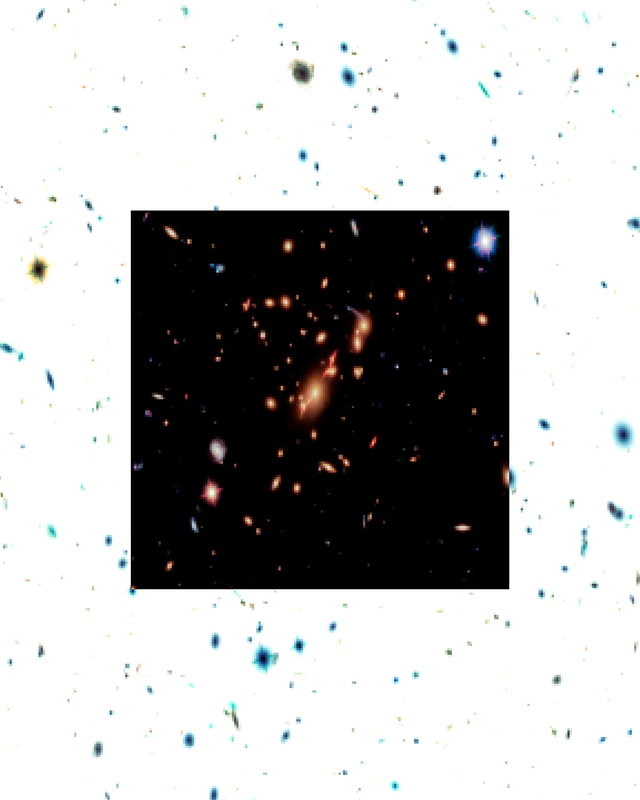 The background galaxy has been magnified, distorted, and multiply imaged by the gravity of the galaxy cluster in a process known as gravitational lensing. Credits: NASA, ESA, and T. Johnson (University of Michigan). BSS-3: Abell 370. The galaxy cluster Abell 370 contains an assortment of several hundred galaxies tied together by the mutual pull of gravity. Photographed in a combination of visible and near-infrared light, the immense cluster is a rich mix of galaxy shapes. The brightest and largest galaxies in the cluster are the yellow-white, massive, elliptical galaxies containing many hundreds of billions of stars each. Entangled among the galaxies are mysterious-looking arcs of blue light. 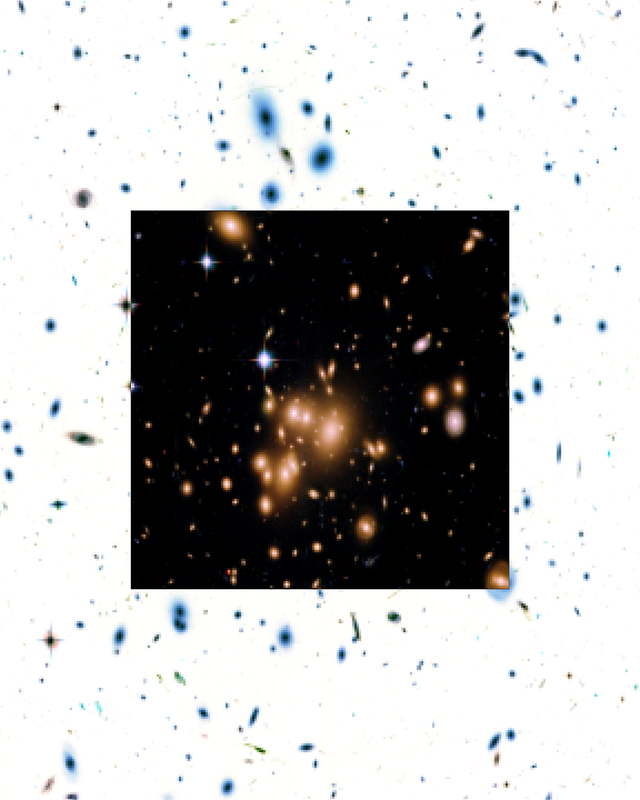 These are actually distorted images of remote galaxies behind the cluster. Spiral galaxies — like the Milky Way — have younger populations of stars and are bluish. Abell 370 is located approximately 4 billion light-years away in the constellation Cetus, the Sea Monster. Credits: NASA, ESA, and J. Lotz and the HFF Team (STScI). BSS-4: Abell 370 Parallel. 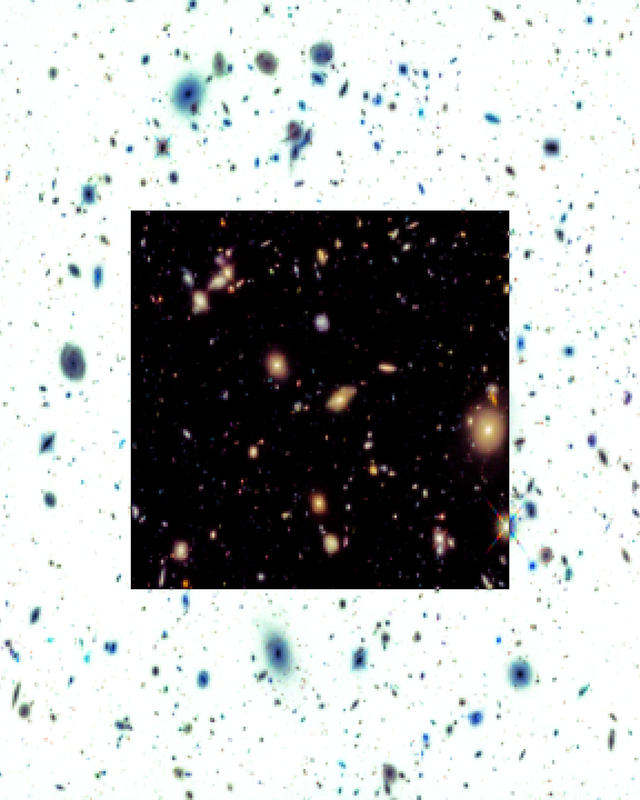 This is a Hubble Space Telescope view of a random patch of sky that reveals innumerable galaxies spread across space and time. 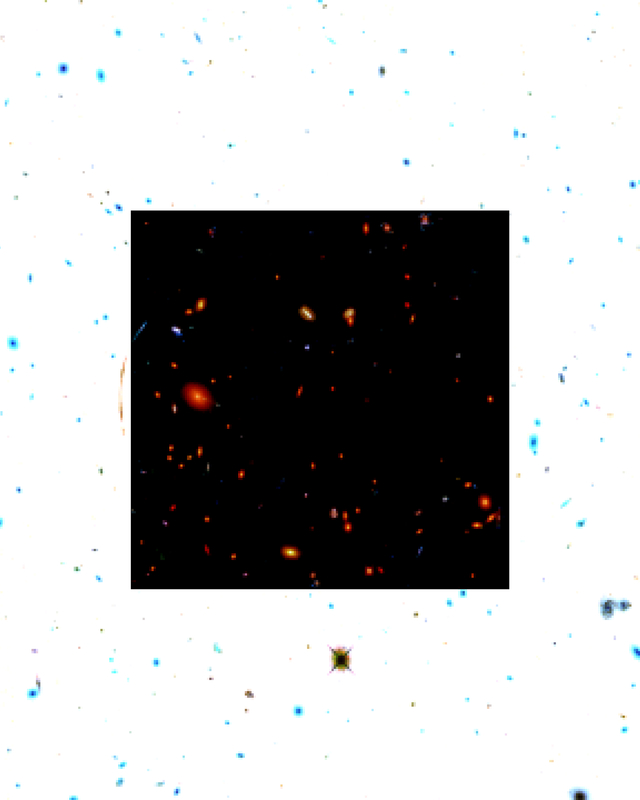 The reddest objects in the image are presumably the farthest galaxies, whose light has been stretched into the red part of the spectrum by the expansion of space. The yellow objects are massive football-shaped elliptical galaxies that contain older stellar populations. The blue galaxies are disk-shaped pinwheels of ongoing star formation. The entire field is peppered with much smaller, fragmentary, blue galaxies – the "building blocks" ancestors of majestic spiral galaxies like our Milky Way. 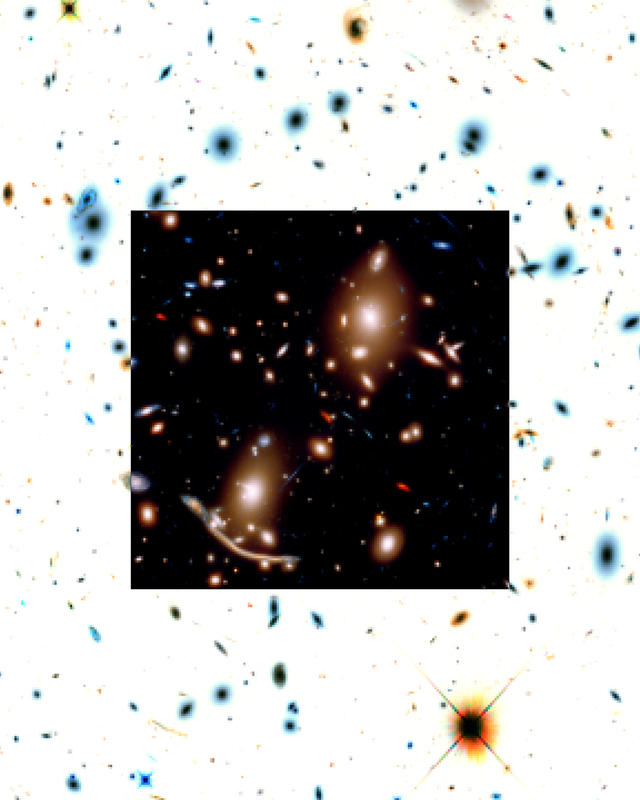 The "parallel field" was taken while Hubble was looking at the primary target, a massive foreground galaxy cluster, while another camera simultaneously viewed the adjacent, seemingly sparse patch of sky. Credits: NASA, ESA, and J. Lotz and the HFF Team (STScI). BSS-5: Galaxy Cluster MACS J1149.6+2223 and Supernova Refsdal. Credits: NASA, ESA, and S. Rodney (JHU) and the FrontierSN team; T. Treu (UCLA), P. Kelly (UC Berkeley), and the GLASS team; J. Lotz (STScI) and the Frontier Fields team; M. Postman (STScI) and the CLASH team; and Z. Levay (STScI). BSS-6: Galaxy Cluster SDSS J1531+3414. NASA's Hubble Space Telescope has photographed the dense galaxy cluster SDSS J1531+3414 in the northern constellation Corona Borealis. Made up primarily of giant elliptical galaxies with a few spirals and irregular galaxies, the cluster's powerful gravity warps the image of background galaxies into blue streaks and arcs. Credits: NASA, ESA, G. Tremblay (ESO), M. Gladders and M. Florian (University of Chicago), S. Baum, C. O'Dea, K. Cooke (RIT), M. Bayliss (Harvard-Smithsonian Center for Astrophysics), H. Dahle (University of Oslo), T. Davis (ESO), J. Rigby (NASA/GSFC), K. Sharon (University of Michigan), E. Soto (Catholic University of America), and E. Wuyts (Max Planck Institute for Extraterrestrial Physics); Acknowledgment: NASA, ESA, and the Hubble Heritage (STScI/AURA)-ESA/Hubble Collaboration. 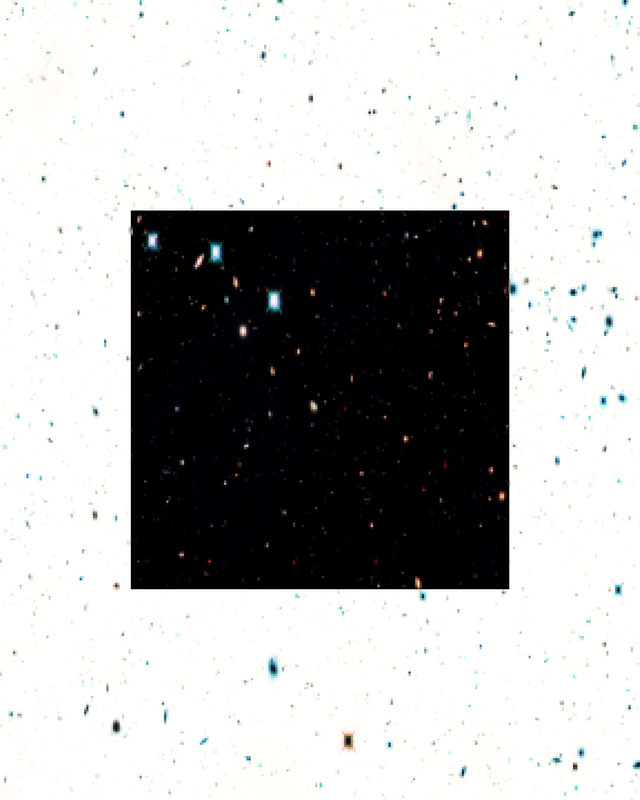 BSS-7: Hubble Ultra Deep Field 2014. Astronomers using NASA's Hubble Space Telescope have assembled a comprehensive picture of the evolving universe – among the most colorful deep space images ever captured by the telescope. 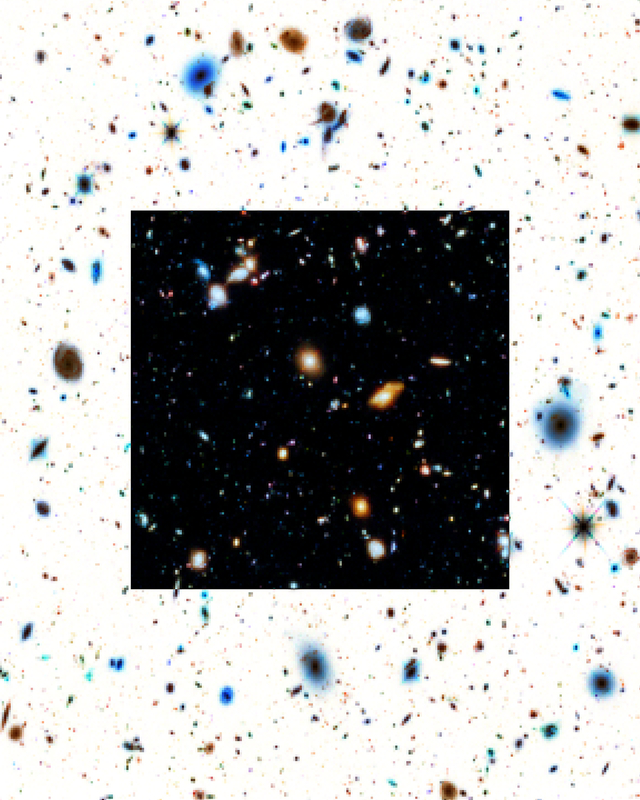 The Hubble Ultra Deep Field 2014 image is a composite of separate exposures taken in 2002 to 2012 with Hubble's Advanced Camera for Surveys and Wide Field Camera 3. Credits: NASA, ESA, H. Teplitz and M. Rafelski (IPAC/Caltech), A. Koekemoer (STScI), R. Windhorst (Arizona State University), and Z. Levay (STScI). BSS-8: Galaxy ESO 137-001. The galaxy is zooming toward the upper right of this image, in between other galaxies in the Norma cluster located over 200 million light-years away. Intergalactic gas in the Norma cluster is sparse, but so hot at 180 million degrees Fahrenheit that it glows in X-rays. The image, obtained through Hubble's Wide Field Camera 3, is also decorated with hundreds of stars from within the Milky Way. Credits: NASA, ESA, and the Hubble Heritage Team (STScI/AURA); Acknowledgment: M. Sun (University of Alabama, Huntsville). BSS-9: Galaxy Cluster Abell 1689. Credits: NASA, ESA, and B. Siana and A. Alavi (University of California, Riverside). BSS-10: MACS J1149.5+2223. Credits: NASA, ESA, and M. Postman (STScI), and the CLASH team. BSS-11: MACS J0717.5+3745. Credits: NASA, ESA, and H. Ebeling (University of Hawaii). BSS-12: CANDELS Ultra Deep Survey (UDS). Credits: NASA, ESA, A. Riess (STScI and JHU), D. Jones and S. Rodney (JHU), S. Faber (University of California, Santa Cruz), H. Ferguson (STScI), and the CANDELS team. BSS-13: Galaxy Cluster Abell 68. Credits: NASA, ESA, and the Hubble Heritage/ESA-Hubble Collaboration; Acknowledgment: N. Rose. 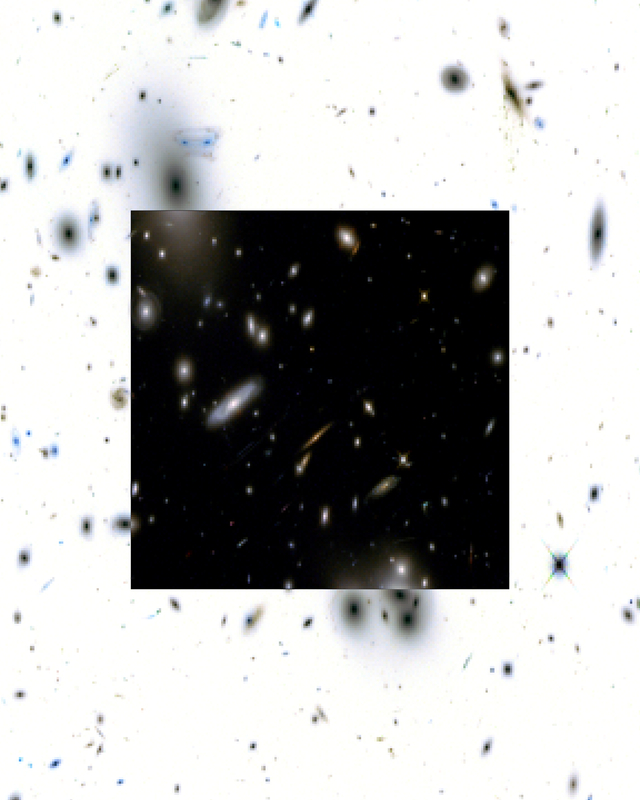 BSS-14: Hubble Ultra Deep Field 2012. Credits: NASA, ESA, R. Ellis (Caltech), and the UDF 2012 Team. 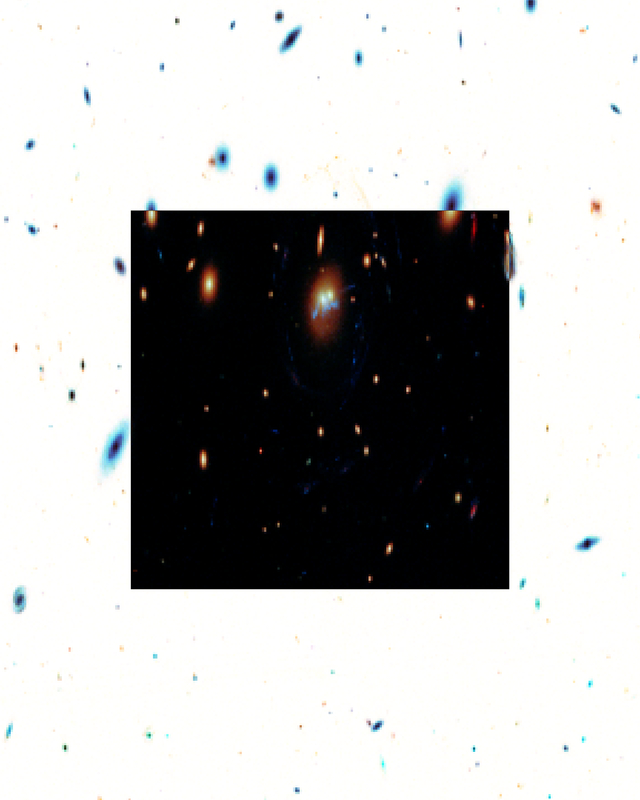 BSS-15: Galaxy Cluster RCS2 032727-132623. Credits: NASA, ESA, J. Rigby (NASA Goddard Space Flight Center), K. Sharon (Kavli Institute for Cosmological Physics, University of Chicago), M. Gladders and E. Wuyts (University of Chicago), and the Hubble Heritage Team (STScI/AURA). When I am in my painting, I'm not aware of what I'm doing. It is only after a sort of 'get acquainted' period that I see what I have been about. I have no fear of making changes, destroying the image, etc., because the painting has a life of its own. I try to let it come through. It is only when I lose contact with the painting that the result is a mess. Otherwise there is pure harmony, an easy give and take, and the painting comes out well."